I have eaten meals in all of the pubs in Brunswick that serve food. On occasion, I have had to wash down a dried up parmigiana with several litres of beer, or borrow from my wife to pay exorbitant prices for a simple meal. Neither episode goes down well with my beloved. After all, who wants to be married to a drunken, penniless pub crawler.Nevertheless, we continue to sample the 'delights' of the Brunswick pub scene, and have come across a gem of a hotel bistro. 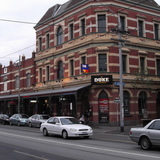 The Duke of Edinburgh, formerly Zagames, in Sydney Road, was named after some grumpy old dude who is married to a queen. There is nothing regal about the establishment. No corgies running around, and the only jewels that could be seen were on a poker machine about five metres from the bistro. My beloved and I, and extended family, visited the 'Duke' bistro on a recent Thursday night, and were surprised to find that we were the only patrons in the establishment. Alarm bells started ringing in my head. Why would a bistro be empty on a Thursday night? Can the food be that bad? We soon discovered that we had nothing to worry about. We were quickly greeted by bistro staff who immediately made us feel comfortable. Soon, we were sipping on ice cold refreshments, and gazing at a comprehensive menu that offered a huge variety of meals. Finally, after the second drink, because it took that long to decide, we gave our order to a very patient staff member, and proceeded to sample more of the fine ales that old Phil, I mean, the Duke, provides to patrons. We didn't have to wait too long for our meals, which were among the best that I have eaten in a pub bistro. My beloved's fish was fresh, covered by a light batter, and fit for a queen. Our children feasted on parmigianas that consisted of succulent chicken breast, and covered with tasty ham and cheese, whilst I devoured an Americana pizza, one of the best pizzas I have eaten in a long time. Sadly, there was no room for the tempting dessert, which was a pity, as the modest prices charged for the main meals meant that I had cash to spare. Knowing that my wife was very pleased that I was not close to bankruptcy, I gathered the brood and left the 'Duke', but scratching my head in bewilderment. Why were we the only patrons in the bistro during a two hour visit on a Thursday night? It could not have been the food. That was superb. Also, the meal prices were very competitive compared with those charged by other pubs. The service was fantastic. Staff were extremely friendly and efficient. Yes, the atmosphere was quiet, broken only by the occasional cha-ching coming from the gaming room, but not enough to spoil what turned out to be a very pleasant night. I don't know what the answer is, but I do know that my bride and I will be back very soon for more of the Duke's fine fare. So, if you're looking for a fantastic meal, at very reasonable prices, and staff who treat you like royalty, look no further than the Duke of Edinburgh, Sydney Road Brunswick.